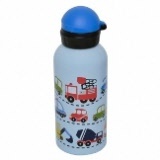 Classic Bobble Art design and functionality with the durable Stainless Steel Bottle and leak-proof pull lid. Bobble Art drink bottles are a great all-rounder drink bottle suitable for school, kindergarten, or any travel. Being stainless steel, the bottle keeps your water cooler for longer. Includes a hygienic lid which seals over the pull top mouthpiece - which is easy to open and close and provides a leak proof seal. 600ml, an ideal size for kids or adults. Simple pull/push mouth piece that also provides a leak proof seal. Note: Handwash only - not suitable for dishwasher or microwave.